He may have hung up his playing boots a long time ago, but Bundesliga legend Lothar Matthäus is still as keen on the game as ever and has been in Kenya to help spread the good word about Germany's top flight. The 56-year-old was given a warm welcome upon his arrival in the capital of Nairobi, where he held football clinics for local youngsters at the Mathare Youth Football Club. 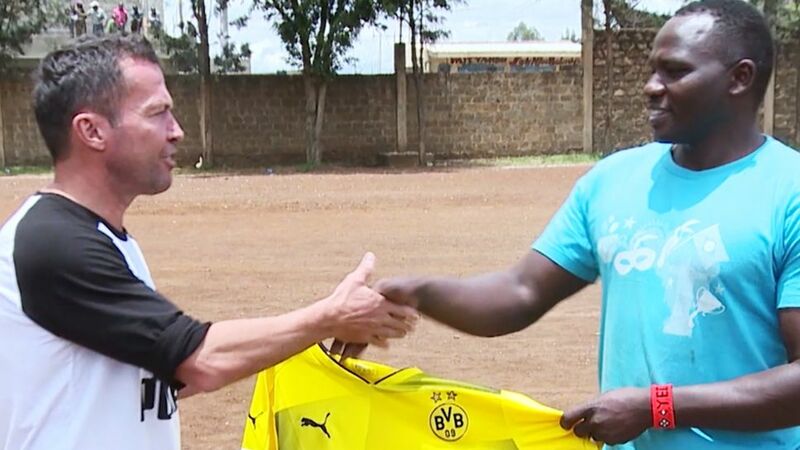 "I like football and I'm so happy to be here, to have a new experience in Kenya," Matthäus said. "I feel the people love football." Alongside posing for countless photos and signing autographs, Matthäus also found time to visit the German embassy in Nairobi and appear on local television channel K24 TV as a football pundit. Furthermore, he competed against Javelin world champion Julius Yego in a light-hearted competition to see who could get the greater combined distance by throwing the javelin and kicking a football. The FIFA World Cup winner also saw some local wildlife on a safari tour and adopted a lion cub, which he named Katharina after his mother. "It's an honour to be here and I like to give something back," Matthäus said. Matthäus is Germany’s most-capped player with 150 international appearances, and he scored 121 goals in 464 Bundesliga games for Borussia Mönchengladbach and FC Bayern München. As well as winning seven German league titles and captaining his country to victory in the 1990 World Cup in Italy, he was the last German player to date to be named “World Footballer of the Year” back in 1991.